Flybe, formerly British European, is an operator of the Bombardier Q400 turboprop aircraft. They are one of the larger operators of the Q400, as they have 45 Q400s currently. Flybe will be operating an additional 24 Bombardier Q400s as they are leasing 24 turboprops from Republic Airways (US); announced in 2014. This will bring an end to Republic's operation of the Q400 for United Airlines. The plane is the main aircraft in its fleet. Flybe also operates the Embraer E175 and E195, however these aircraft are a smaller part of their fleet. If you are flying on Flybe the chances are that you are likely flying on the Bombardier Q400. Also Flybe was formerly called British European before changing its name in 2002. The Bombardier Q400 is a regional turboprop that is known for its speed, efficiency and quietness. Built by Bombardier in Canada, it is powered by two PW150A engines and two Dowty R408 propellers. The plane entered into commercial service at the end of 1999 and Flybe has been one of the largest operators of the aircraft. The aircraft usually has 65 to 86 seats, however the Flybe Q400 has 78. To learn more about the Q400 visit the other pages detailing certain areas of the aircraft. Above photo by Alf van Beem on Wikimedia Commons, modified by FlyRadius. The Flybe Q400 has 78 seats in a one class configuration with 2 seats on each side of the aircraft in a 2 by 2 configuration. The seat pitch for the Flybe Bombardier Q400 is 30 inches. Below is an example of a Flybe Q400 seat map. Flybe does not post a seating plan / chart for it's aircraft. More seating charts can be found on this page. 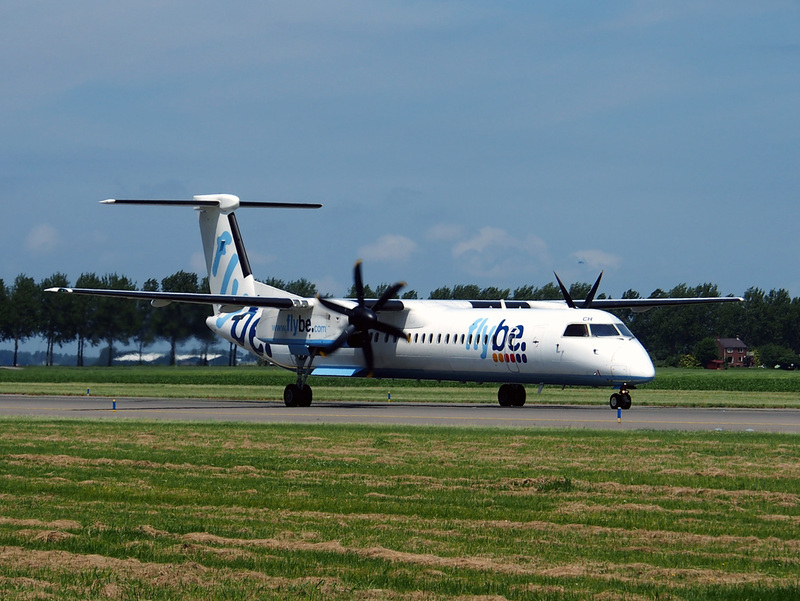 The Flybe Q400 turboprop flies around the European countries with a central location of Britian (The United Kingdom). Bombardier DH4 Flybe: "DH4" is the Q400s IATA code that is primarily used by airlines to identify the aircraft. Learn more on the DH4 page. Bombardier DH8D Flybe: "DH8D" is the ICAO code for the airplane and is used by airlines, air traffic control and others. To learn more about this name visit the DH8D aircraft page. De Havilland Canada DHC-8-400 Flybe: This is the model name for the turboprop. De Havilland was the previous division of Bombardier that built the aircraft. The De Havilland name has been phased out by Bombardier, so it is called the Flybe Bombardier DHC-8-400. DHC-8-400 is the official model name used by aviation regulators to identify the aircraft. More on this can be found here. De Havilland Dash-8-400 Flybe: the Dash-8-400 name is the name that was previously given to the aircraft by Bombardier. The Q400 was apart of the Dash-8 series program of turboprops. Bombardier then decided to change the name of those aircraft to the Q series turboprops and the Dash-8-400 became the Bombardier Q400. More on the Dash-8-400 name is found here.